Take Route 287 to exit 57, follow signs to Ringwood State Park. Office Hours: Open daily 8 a.m. to 4:30 p.m.
Due to the closure of the bridge across Ringwood Brook, the segment of the Ringwood/Ramapo (red) and Crossover (white) Trails between Parking Lot B in the Ringwood Manor section and Sloatsburg Road is currently closed. Access to these trails and adjoining trails is available from the Shepherd Lake section of the park. Approximately a 3/4 mile portion of the Hasenclever Iron Trail is temporarily closed to the public in the area of Peter's Mine. From the Ringwood Manor side it is approximately 1.5 miles in and 4 miles in from Long Pond Ironworks. There is currently no reroute, please plan accordingly. For more information call the park office. Dedicated in 1984, the garden is the culmination of two eras of landscape architecture under the direction of Francis Lynde Stetson, owner of Skylands from 1891-1922. The garden contains an extensive variety of plants, evergreens and deciduous trees and shrubs in specialty areas. Of particular interest are the crabapple vista, terraced gardens, perennial and annual gardens and woodland paths. The extensive vistas of the garden and veiw of Ramapo Mountains frame this 96-acre botanical showplace. Visitors can tour the gardens and surrounding woods year round, from 8 am to 8 pm. For more info check out the New Jersey State Botanical Gardens (NJBG) Skylands Association Web site. For information on wedding ceremonies and receptions in the gardens please call (973) 962-9370 or visit Frungillo Catering. This beautiful country house, which was home for a succession of well-known ironmasters for nearly 200 years, sits comfortably on a low hill overlooking a landscape that looks as if it escaped from a painting. Iron production in this area began in the 1740s. In the mid-19 century, Ringwood Manor was owned by Abram S. Hewitt, America's foremost ironmaster. Tours are offered from Wednesday through Sunday year round from 10 am to 3pm. Please call in advance to check the daily schedule. Ringwood Manor is part of a National Historic Landmark District. For more information on Ringwood Manor visit the New Jersey Highlands Historical Society Web site: www.ringwoodmanor.org. Skylands Manor with its English Jacobean architecture common in the English countryside 400 years ago, was designed by John Russell Pope for Clarence McKensie Lewis, a stockbrocker and civil engineer. Built in the 1920s, it is constructed of native stone and half-timbers. The weathered stone facade of this 44-room mansion blends into the landscape. The mansion contains rooms with antique paneling as well as new American Oak paneling and large windows, some of which contain 16th-century stained glass medallions. Moulded plaster ceilings and an elaborately carved staircase add the finishing touches to this impressive county house. Tours are offered one Sunday per month March through November. For tour information please visit the NJBG/Skylands Association Web site. Skylands Manor is available for weddings and special events hosted by Frungillo Caterers. For more info please call (973) 962-9370 or visit Frungillo Catering. The spring-fed waters of the 74-acre Shepherd Lake are brisk and invigorating and offer swimming in the designated swimming area while lifeguards are on duty. Please check our swimming schedule prior to your visit. Inner tubes, rafts and other flotation devices are not permitted in the swimming area. Only Coast Guard approved life jackets are permitted. Pets are prohibited on the beach. Boating, canoeing and fishing are permitted with boat rentals available. A network of trails surrounds the lake leading to rocky vistas. NOTICE: Approximately a 3/4 mile portion of the Hasenclever Iron Trail is temporarily closed to the public in the area of Peter's Mine. From the Ringwood Manor side it is approximately 1.5 miles in and 4 miles in from Long Pond Ironworks. There is currently no reroute, please plan accordingly. For more information call the park office. An intricate system of marked hiking trails are available for the public to explore, some of which connect the Ringwood and Skylands sections of the park. These trails offer visitors opportunities to explore interior woodlands and rocky vistas. Multi use trails are also available in the Skylands section of the park. These trails are suitable for hiking, horseback riding, mountain biking, cross country skiing and snowmobiling. Please obey all designated uses of the trails, posted at the trail heads and trail crossings. A 7.5 mile mountain bike loop trail begins in the Shepard Lake section of the park. For information on this trail and mountain biking volunteer opportunities please visit Jersey Off Road Bicycle Association. Please note that the trail difficulty ratings are opinion only. 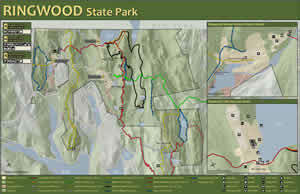 All trail mileages represent only the portion of the trail that goes through Ringwood State Park, and complete trail lengths could be longer, therefore a topgraphical trail map is recommended for navigation of the trails. 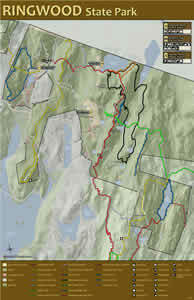 Maps may be purchased in the park office or through the New York - New Jersey Trail Conference Web site. A park map is available in the park office. Hunting is permitted in designated areas within the park and is subject to Division of Fish and Wildlife regulations.